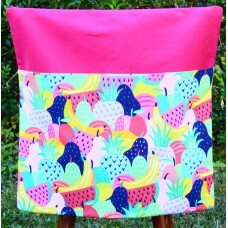 Featuring a fruit print on the pocket of this hot pink chair bag. 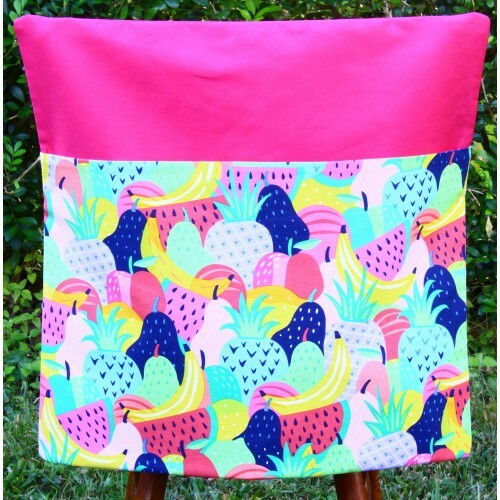 Made from high quality 100% cotton textiles from Pink Petunias this chairbag has been lined with the same hot pink fabric making it strong and durable. Designed to fit straight backed school chairs, this bag is easy to launder. Available in large. Design: Monsters on Green. Pattern placement may vary. Lots of different dogs feature on the pocket of this electric blue School Chair Bag. Use this chair ..
Skull designs are always a hit and this school chair bag from Pink Petunias is no exception. Manufac.. This is for the many boys and girls who play soccer. Perfect for the sporty kid in your family. Made.. This School Chair Bag features the pocket in a thong design on a bright orange bag. The perfect stor..
Puppy on brown make this chair bag very appealing. Made from high quality 100% cotton textiles from ..